The way to begin any discussion of the Trans-Pacific Partnership is with a simple question: Where does this sweeping global trade deal rest power—with the people and their elected representatives in the United States and 11 other Pacific Rim countries, or with the multinational corporations that have been empowered by every previous trade deal of this kind? The answer, if history is any indication, and if reports on the the secretive agreement are accurate, is that the power will rest with the corporations. Grijalva and Ellison were right to cite the economic and environmental concerns. But they were even more right to focus on concerns about how the TPP fails to “protect nationhood rights by prohibiting special corporate courts through Investor State Dispute Settlement (ISDS) provisions.” No matter what claims are made regarding side deals and “progressive” language, a trade agreement that allows secretive “dispute resolution” along lines that overwhelmingly favor multinational corporations undermines rather than strengthens worker rights and environmental protections. A New York Times report published Monday explained that the TPP agreement “would overhaul special tribunals that handle trade disputes between businesses and participating nations” in response to “widespread criticisms that the Investor-State Dispute Settlement panels favor businesses and interfere with nations’ efforts to pass rules safeguarding public health and safety.” The “overhaul” involves what the Times referred to as “a code of conduct [that] would govern lawyers selected for arbitration panels.” There’s also a “carve out” to address abuses by “Big Tobacco.” That’s fine; but the problem goes far beyond lawyers, and far beyond the wrongdoing of one industry. The problem goes to the heart of the matter of whether special tribunals, which exist to advance free trade, will have the power to help multinational corporations circumvent or undermine local laws. These legitimate concerns are unlikely to be addressed in a realistic manner by advocates for the agreement—or in most media coverage of the TPP debate. Supporters of trade deals of this kind have learned their lessons. They promoted the North America Free Trade Agreement (NAFTA), the General Agreement on Tariffs and Trade (GATT), the extension of “Most Favored Nation” trading status to China, the US-Korea Free Trade Agreement, and so many others as windfalls for workers in the United States and abroad. They promised prosperity and stability. They promised that the free market would sort out any and all concerns about the rights of workers, farmers and consumers, about the environment, about human rights. The promises were never kept. “As we’ve said, rushing through a bad deal will not bring economic stability to working families, nor will it bring confidence that our priorities count as much as those of global corporations,” explained Trumka. Step two is to focus on the mechanisms that will undermine transparency—and accountability—if the TPP includes corporate-friendly provisions for investor-state dispute settlement. 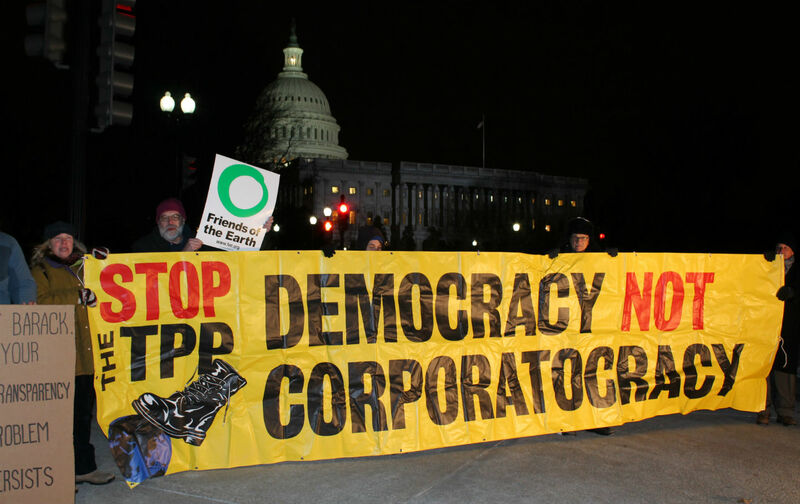 Congress will have a chance to vote on the TPP. There will be immense pressure from corporate lobbies and the White House to simply say “yes.” There will be immense spin. But the core issue of whether corporations can be effectively regulated and held to account comes down to the ISDS question. The bottom line is as it has always been: A trade agreement that rests power with multinational corporations, rather than with the people and their elected representatives, is a bad deal.